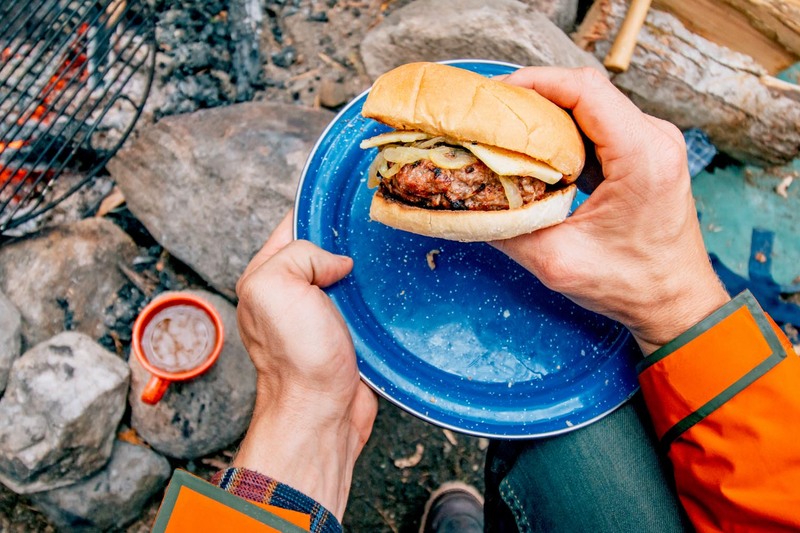 Shredded apples, caramelized onions, and sharp Vermont Cheddar, these fall-inspired hamburgers are a perfect way to capture the taste of a New England autumn. 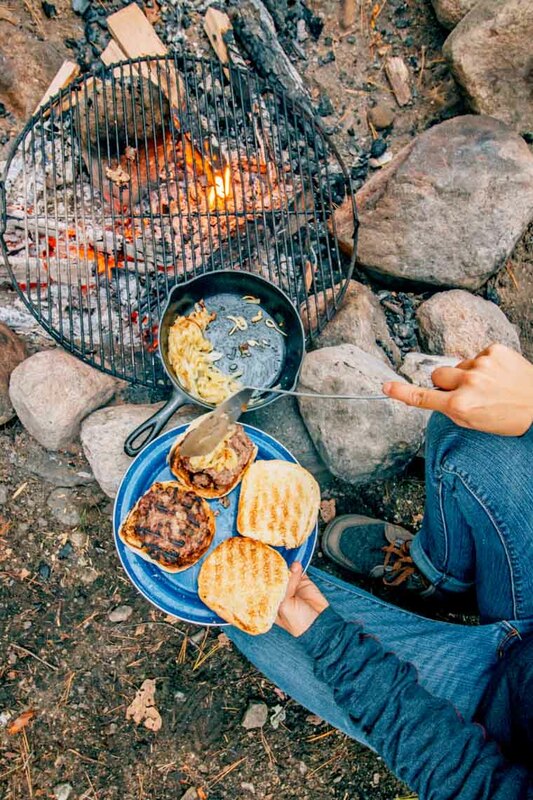 A new take on classic BBQ fare, these hamburgers bring together variety of complimentary fall flavors into a simple camp-friendly meal. First, the onions are caramelized using a small saute pan. Next, peel the skin off of an apple and grate it. The shredded apple is then mixed together with the hamburger meat. Not only does this help keep the burger moist throughout, but it also ensures that the apple flavor is in each and every bite. 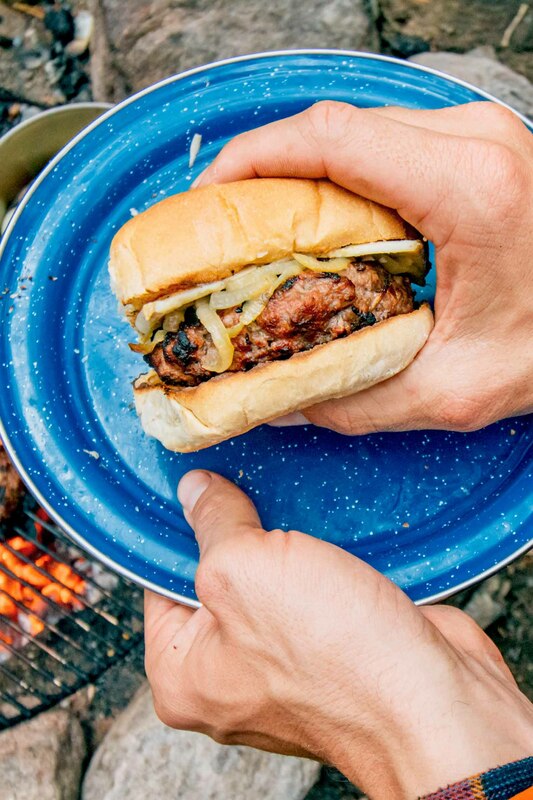 ‣ What’s great about this recipe is how with just a few ingredients, you can elevate your standard summer BBQ hamburger into a seasonal speciality. ‣ Keep the heat low while caramelizing the onions, and don’t rush them. The savory and slightly sweet flavor as a result of the slow caramelization of their sugars are a killer accompaniment to the sharp cheddar. ‣ Salt your burger patties only after they’ve been formed. Keeping the salt on the outside adds flavor without altering the composition of the meat’s proteins. If you mix the salt with the meat while making the patties, the burgers will have a tougher, denser texture. ‣ We used ground beef with a 85% lean to 15% fat ratio. You don’t want to go much leaner than this or your burgers will start to lose their structure and they will be drier. 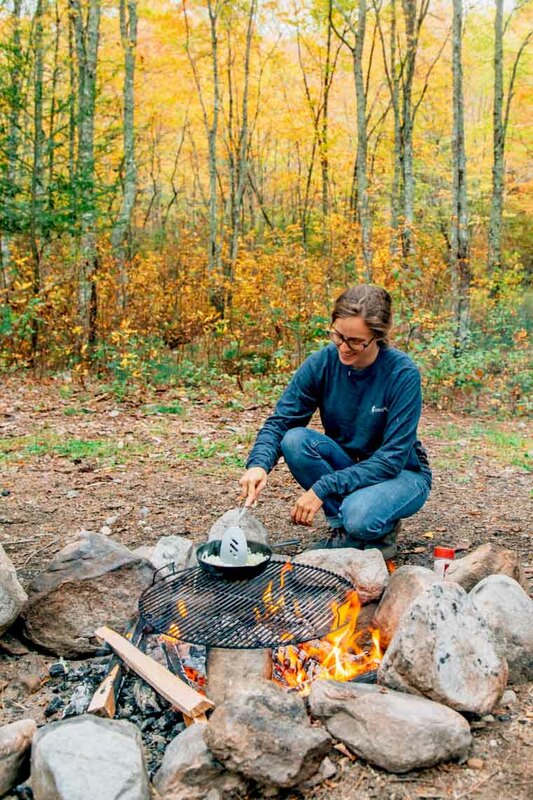 CARAMELIZE THE ONIONS: Add the onions, olive oil, and salt to a small skillet and place over the fire at medium-low heat. Cook, stirring occasionally, until the onions are soft and beginning to caramelize, about 20-25 minutes. FORM THE BURGER PATTIES: Meanwhile, peel & grate the apple on the large holes of a cheese grater. Mix with the ground beef and salt, then form into six patties. GRILL THE BURGERS: Cook the patties over medium-high heat, about 3-4 minutes on each side. Toast the buns, then build the burgers, topping each with the cheddar, caramelized onions, and any other condiments you wish. Form the patties at home, omitting the salt. Prepare the caramelized onions at home on your stovetop. 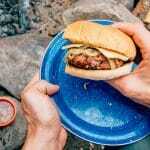 Stove the patties and the onions in separate airtight containers in your cooler until ready to cook. 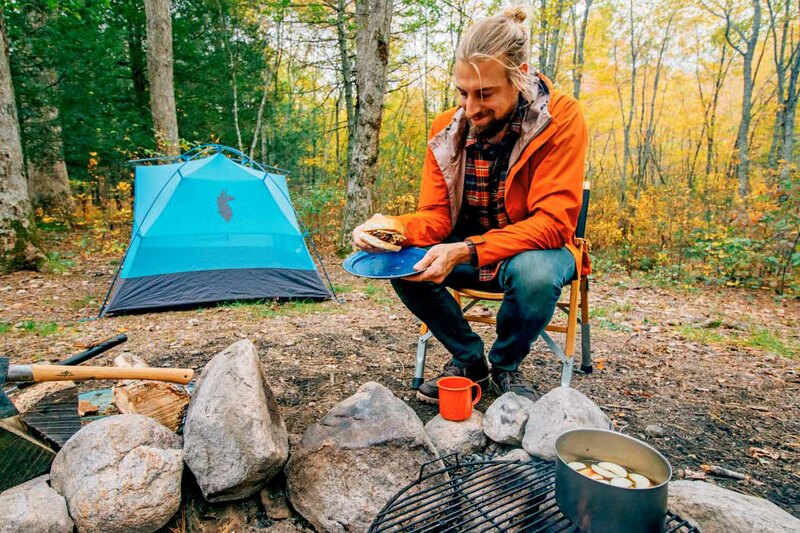 Salt the patties right before grilling at your campsite and reheat the onions in a small skillet until warmed through. I just bought the ingredients and am getting ready to fire up the grill! Great sounding recipe! I love simple recipes like this one, just a few ingredients and nearly zero margin for error (which is entirely possible given my limited cooking skills). We love Cabot, too! It’s actually what we used in this recipe. Gotta love that Vermont cheddar.